Photo Caption: (L-R) Kevin Quinlan(Coach), Philip McSweeney, Donnagh Crowley, Paul O’Mahony(Captain), Barry Lynch, Karl McLoughney, Maciej Truchan(inset). UCC are the 2017/18 Munster Squash senior league champions having defeated Celtic (Waterford) 3/2 in the final fixture. Celtic were the defending champions and were chasing three in a row league titles but the students’ win in the final fixture preserved their unbeaten league season and gave them a deserved title. Key moments along the way included a very tight away win to Celtic at the beginning of the year, as well as two strong performances against a determined Sunday’s Well. The UCC team featured former junior internationals as well as strong performers at Munster level. Team members were Philip McSweeney(Highfield), Barry Lynch(Highfield), Paul O’Mahony(Captain, Highfield), Donnagh Crowley(Gleneagle), Maciej Truchan (Gleneagle) and Karl McLoughney (Thurles). This was an outstanding result for a young UCC team who were very focused and committed throughout the entire league campaign. 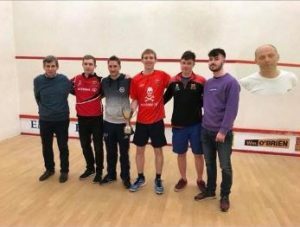 The result is also a huge boost for UCC Squash Club which is thriving at present and had teams competing in other divisions of the Munster Squash leagues, as well as a successful run in the recent intervarsities competition, hosted in UCC.